One thing I know is that feelings are social. Joy, sadness, anger, elation, jealousy, envy, despair, anguish, grief—all these feelings are partly social. Feeling is elicited by interactions we experience, remember, or imagine having with people in our lives. Feelings are social in that sense. Moreover, each culture provides prototypes of feeling, which, like differently toned keys on a piano, attune us to different inner “notes.” For example, the Tahitians have one word—sick—for what in other cultures might correspond to ennui, depression, grief, or sadness. According to the Czech novelist Milan Kundera, the Czech word “litost,” refers to an indefinable longing, mixed with remorse and grief, which has no equivalent in any other language. Cultures lay out the possibilities for subjectivity and in that way guide the act of recognizing a feeling. Apart from what we think a feeling is, we also have ideas about what it should be. We say, “you should be thrilled at winning the prize” or “you should be furious at what he did.” We evaluate the fit between a particular feeling and context in light of what I call “feeling rules,” which are themselves rooted in culture. Given such feeling rules, we may then try to manage our feelings. We try to be happy at a party or grief-stricken at a funeral. In short, it is through our apprehension of an interaction, our definition of feeling, our appraisal of feeling, and our management of feeling that feeling is social. If, as C. Wright Mills said, the job of sociology is to trace the links between private troubles and public issues, the sociology of emotion is—or should be—at the very heart of sociology. Over the last 40 years, the number of service sector jobs has grown. By my estimate, some six out of 10 of those service jobs call for substantial amounts of emotional labor. This work doesn’t fall equally upon the two genders; roughly a quarter of men but half of women work in jobs heavy in emotional labor. Emotional labor has hidden costs, and these fall more heavily on women. Increasingly, emotional labor is going global. 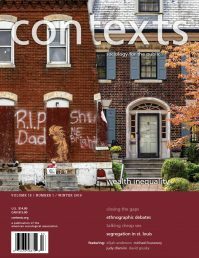 In my latest work, I have written about a south-to-north “heart transplant.” Here, a growing number of care workers leave the young and elderly of their families and communities in the poor southern countries to take up paid jobs caring for the young and elderly in families and communities in the affluent northern ones. Such jobs often call on workers to manage grief, depression, and anguish vis-a-vis their own children, spouses, and parents, even as they genuinely feel—and try to feel—joyful attachment to the children and elders they daily care for in the north. Emotional labor crosses borders in other ways as well. Through telephone and email, service providers in Bangalore, India, for example, tutor American children with math homework, make long—distance purchases of personal gifts, and even scan romantic dating service Internet sites for busy professionals. What we see here are the paradoxes—and sometimes estrangements—involved in commodifying even the smallest, most personal acts. The idea of emotional labor—and of a sociology of emotions in general—helps illuminate the “hidden injuries,” to quote Richard Sennett, of all the systems we study, including the latest versions of sexism, racism, and capitalism. Arlie Hocschild is in the sociology department at the University of California, Berkeley. The Managed Heart: The Commercialization of Human Feelings is one of her many books.